Lit with bright overheard fluorescents and littered with massive wooden crates the size of backyard sheds, GM’s R&D garage feels less like a hangout for grease monkeys and more like a Hollywood sound stage. 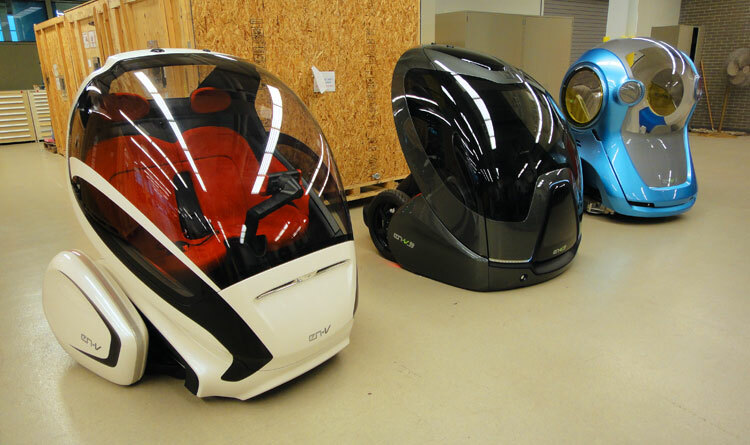 The sleek, pod-shaped vehicles dotting the floor could be movie props. – or perhaps leftovers from Blade Runner or Total Recall, maybe. Until they sit up, almost silently, and begin moving. On two wheels no less. 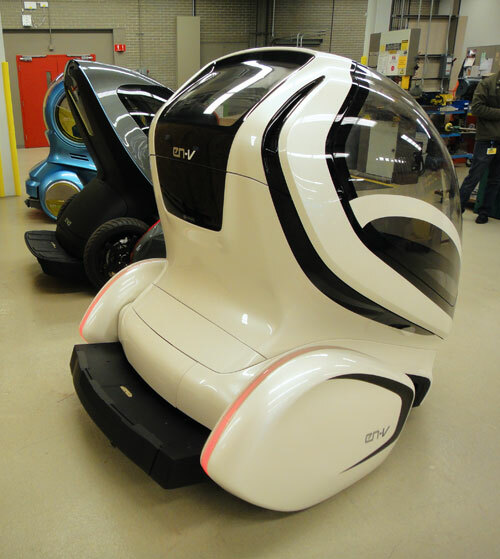 The EN-V concept vehicle, which originally debuted in Shangai all the way back in 2010, represents GM’s vision of what the car may morph into by 2030. But don’t let the far-flung date fool you; all the technology exists to build the EN-V today, exactly as it looks. Quite unlike many other concepts that have done their time under the scorching lights at trade shows, the EN-V is far from dead or forgotten nearly two years later. It’s a vehicle waiting for its city. Though the EN-V’s balanced two-wheel operation no doubt draws crowds, it may be the least radical aspect of a design far deeper than its carbon fiber skin. The car, designer Chris Borroni-Bird is quick to point out, could just as well have three or four wheels. The magic lies in the parts you can’t see — it’s a computer on wheels. 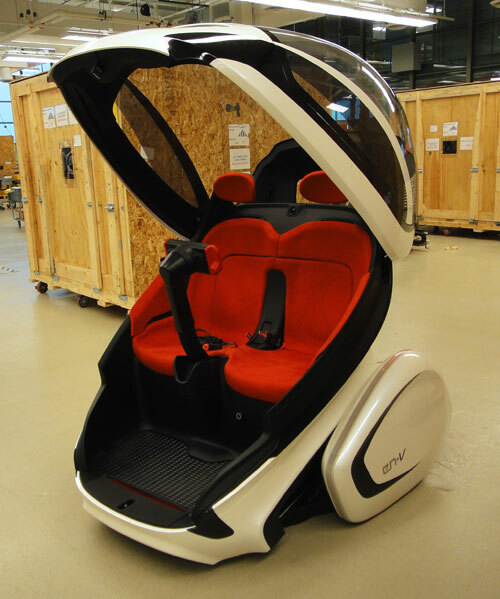 EN-V stands for Electric Networked Vehicle. Rather than working toward a vehicle that could run longer, faster or be built cheaper, GM focused on making the EN-V smarter through connectivity, and the rest fell into place. The shape of a traditional car — electric or gasoline-powered — ends up being dictated largely by what needs to happen when it crashes. A motor and wheels seem to leave plenty of room for what goes around them, but throw in crash zones, bumpers, and all the other trimmings of safety in the modern world, and what seemed like a blank slate ends up looking pretty much like, well, every other car on the road. GM threw those conditions out for the EN-V, not because it will never see the light of real city streets, but because the streets it will someday roam will be crash free. In theory, at least. Through a sophisticated array of sensors and car-to-car communication, the EN-V should essentially be uncrashable. Besides always knowing where it is in a city, the car should more importantly know where every other nearby car is, with backup sensors for other obstructions — like pedestrians and bicyclists. Using short-range radios that can communicate with vehicles blocks away, the EN-V can keep tabs on all the networked cars around it, braking before a T-bone at the next light, speeding up to avoid a rear-end collision, or changing lanes to make room for another car entering the flow of traffic. Stop worrying about accidents, and suddenly you can stop building a car around the worst-case scenario. And if you stop building a car around the worst case scenario, it gets smaller and lighter. Make a car smaller and lighter, and the batteries will carry it further. The benefits of a networked vehicle in a networked city trickle down into every aspect of its design. While many futurists envision future metropolises full of maglev trains, subways and other public transportation, GM (perhaps not surprisingly) still sees a place for cars in future cities. After all, despite the overwhelming cost and hassle of keeping one in urban areas, city dwellers still go out of their ways to keep four wheels around. The EN-V could potentially afford owners all the freedom of a car in the city, without the hair-pulling frustration of parking, fighting traffic, or even fueling up. Besides the obvious safety benefits of car-to-car communication, a truly networked car has other perks as well. Using GPS to navigate streets and the sensor network to avoid accidents on them, the EN-V could drive autonomously without thousands of dollars in sensors, like other prototype autonomous cars. The LIDAR equipment on DARPA’s Urban Challenge competitors, for instance, is both enormous and expensive. Scaling it back to deal with either of those problems reduces accuracy — not something you want to skimp on when you’re relying on it to safely pilot a ton of rolling steel. By contrast, the EN-V uses just an acoustic distance sensor and an inexpensive 2D camera, with car-to-car data and GPS to fill in the gaps. Just hop in, tell it where you want to go, and you’re rolling. Small size has its own perks. With the space saved by eliminating crash zones, you can park three of EN-Vs in the same spot it would take to fit one full-size car, and the two-wheeled design allows it to spin 360 degrees in place to navigate into minuscule spaces even a Mini driver would roll right by. Not that you would need to look for parking: A smart city would include parking space sensors similar to the ones used in modern parking garages to measure capacity, then point the EN-V directly to an open spot near your destination. In densely populated urban areas, GM researchers found that roughly a third of drivers on the roads were simply looking for parking. Cut that out, and congestion dissipates without barring anyone from the streets.